Say what you will about their policies, their candidates and their internal squabbles, if there’s one thing the Democrats do know about, apparently, it’s beer. Why else would they choose to hold their national convention in one of the best beer towns in the country? At least a couple of area breweries recognize this. Seizing the opportunity that political fate has afforded them, the Great Divide Brewing Company of Denver and Oskar Blues of nearby Fort Collins are making the most of the convention, with Great Divide trotting out a special beer and Oskar going after the PR angle. Liberally Hopped American Pale Ale from Great Divide is described as having “moderate hop bitterness and (a) refreshingly piney hop flavor” along with “a smooth and subtle malt character.” (Descriptives courtesy of the brewery; I have yet to taste the ale.) The 6.1% alcohol beer is meant to appeal to a “broad coalition of palates,” according the the press release. 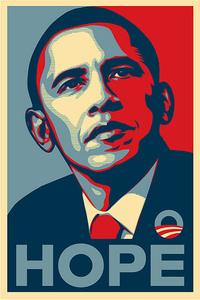 Oskar blues, on the other hand, have gotten a bit artistic in their attempts to gain favour amongst the Dems, with this riff on the Obama “Hope” poster. 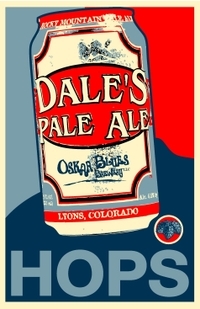 Apparently, their plan is working: Brewery mouthpiece Marty Jones reports of a steady stream of Convention associated events that will feature Dale’s Pale Ale and other assorted Oskar Blues brews, including tomorrow’s Denver Dem's City Park Fest. Just a reminder to you all that while we may still be in mid-August, Oktoberfest season is just around the corner. In fact, if you check with your distributors this or next week, I’ll be you’ll find that the autumn seasonals are flowing into the warehouse even as I type these words. So, what should you be stocking for your Oktoberfest celebrations? German beers, of course, but also nationally and locally brewed interpretations of the Bavarian styles which dominate around that time of year: crisp and lean pilsners; the delicious, moderately hopped blonde lagers called helles (“hell-ess”); a dark lager or two, known as dunkels (“Doonk-ells”); perhaps a bock or three; and most certainly one or several representatives of the style known as märzen (“mare-tzen”) or sometime Oktoberfestbier, which is the definitive beer of the festival period. There’s your assignment. Better get on the phone now. It would be a stretch to say that the North American beer world has been abuzz since the announcement that Anheuser-Busch would soon be coming out with an ale marketed under the Budweiser banner, but it has been talked about a bit. Perhaps more than a bit. And now it’s here. 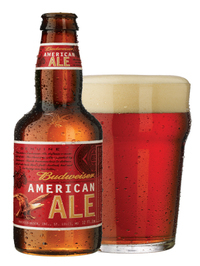 Budweiser American Ale is described on the label as a “rich, amber-colored ale” with a “robust flavor and a distinctive, hoppy finish,” which sounds interesting enough. It also sounds like a massive departure from the more muted taste profile of its label mates, Budweiser and Bud Light, but to the same degree, Sam Adams Light has little in common with Sam Adams Utopias, the strongest beer in the world. So let us ignore for a minute prejudiced preconceptions and see what this new ale tastes like. It is most definitely amber, that’s for sure, and boasts an attractive and welcoming aroma redolent with fruit, mostly cherry and plum, backed by faint underpinnings of citrus and chocolate. In the body, it has a smooth, fruity-chocolate start leading to an off-dry body with nutty and fruity notes alongside hints of caramel and a very subtle suggestion of allspice, some light tannins and a most modest hoppiness. The hop rises somewhat in the finish to dry it further and leave a soft, lingering, nutshell bitterness on the tongue. Tasted alongside a regular Bud, two bottles of which A-B delivered to me along with an equal number of American Ales, it certainly does taste “robust,” but I don’t know if it would rate the same descriptive when sampled against, say, a Sierra Nevada Pale Ale or Anchor Liberty. That said, I can easily see it finding favor among mainstream lager drinkers who are interested in branching out to something different, which no doubt is the role it was developed to fill. One interesting observation, which I noticed when comparing the labels of the original Bud and the American Ale, is that the new beer is lacking the much vaunted “Born On” dating of its older sibling. Which makes me wonder if A-B is ever so slightly worried about stocks of American Ale languishing in stores and bar refrigerators. A while back I was complaining to a fellow chronicler of beer that I was growing rapidly tired of heaping praise upon the San Diego brewery, The Lost Abbey, and its cult favorite brewer, Tomme Arthur. Problem was, Arthur just kept making great beer after great beer, and when you’re in the business I’m in, it’s pretty damn difficult to ignore that sort of thing. Now, granted, that was the result of a choice made from a mere 46 casks – which makes me wonder why CAMRA elected to give out such an award in the first place, given that the other awards they present come as a result of a lengthy, multi-tiered judging process meant to represent all the ales in Britain – but no matter, it’s an honor which in my opinion would be well-deserved regardless of the number of competing brews. If you’ve not yet tried The Angel’s Share, or any of the other fine Lost Abbey beers, I’d suggest you get your hands on some as soon as possible. Once word of this latest win leaks out, surely they will become even more rare than they already are.